Dinosaurs may not have been the most fearsome creatures to stalk the Saharan plains. Paleontologists have discovered fossils of several crocodile species that indicate some crocs galloped upright on land, some were enormous, and some literally ate dinosaurs for breakfast. National Geographic Explorer-in-Residence Paul Sereno announced the discovery of fossils of five crocodile species in the Sahara. Three of the species were previously undiscovered; the other two had been recorded and named before, but were poorly understood. Unlike modern crocodiles, many of these ancient crocs had upright skeletal structures, allowing them to gallop on land even as their tails made them extremely strong swimmers. The largest of the species is the so-called BoarCroc, a 20-foot long meat-eating machine. The BoarCroc, described as a "saber-toothed cat in armor," had three rows of fangs, ideal for chowing down on dinosaurs. The flat-bodied PancakeCroc was also 20-feet long and could wait for hours in the water for "something stupid" to come along. The other crocodiles pursued less fearsome prey. 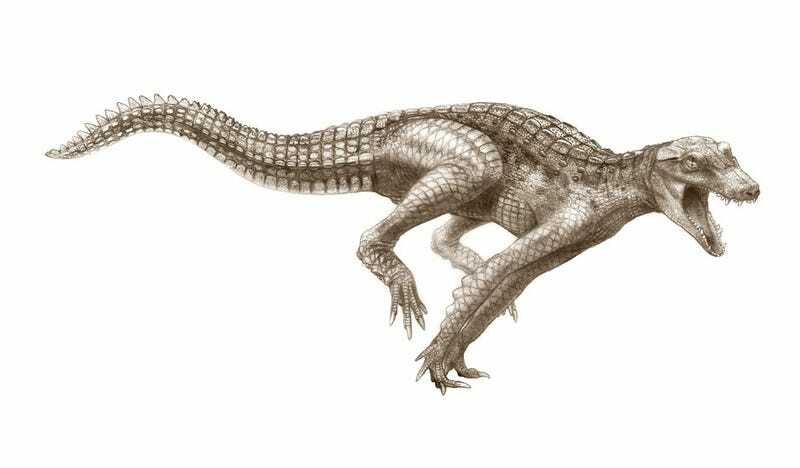 The three-foot RatCroc had buck teeth for digging at tubers and small rodents. The DuckCroc's bill-like snouted helped it snap up fish and frogs, and the long-legged, agile DogCroc (pictured above) likely preferred plants and grubs. These five species join the already known SuperCroc, Sarcosuchus imperator, which, at 40 feet and a whopping eight tons, was the Sahara's largest crocodile.